How do experiences of hope and despair impact upon our capacity to meet life's challenges in narrative and family therapy? Clients' experiences of hope and despair can be complex, reflecting individual and family histories, current patterns and dynamics, the stresses of everyday life, and the social contexts of families' lives. This book analyses how therapists meet and engage with these dichotomous aspects of human experience. reflections on reconciliation and forgiveness. 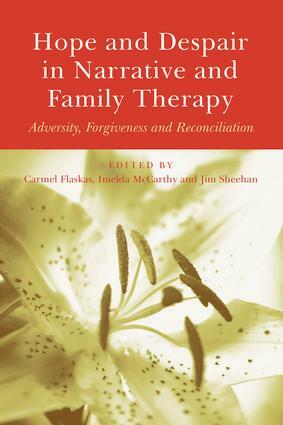 Hope and Despair in Narrative and Family Therapy looks at the importance of hope in bringing about positive therapeutic change. This book will be of great use to family therapists, psychotherapists, counsellors, and students on therapeutic training courses.